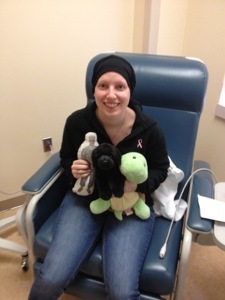 It’s been almost three weeks since my final chemo treatment. It’s been too long since my last post too. Things have gotten a bit crazy since then. 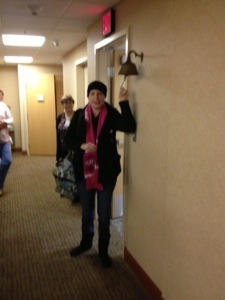 First off, saying goodbye to chemo was great! I got to ring the bell at the infusion center for completing my treatment and all the nurses signed a certificate commemorating my journey. I have since then been trying to hold on to that happiness. The neuropathy is progressing and I am doing my best to cope with this side effect. I’m also tired all of the time. It’s a tired that I can’t explain. I can basically fall asleep whenever and wherever in a matter of seconds. This can be very disruptive when it comes to my normal daily activities. Which brings me to the next thing that has occurred. I am not working. My doctor put me out of work for the next 8 weeks. She felt this was in my best interest given the side effects I’m experiencing and how I’ve been dealing with the stress of working through Chemotherapy. She said that my side effects will continue to add up for the few weeks that follow my last treatment before they start to get better. And then I will begin radiation for 6 weeks with treatment everyday. This will also add to the fatigue which will build up throughout treatment and last a few weeks after treatment ends just like chemo. Fun times ahead! I have been to so many appointments over the last couple weeks! I had my radiation consult, a CT scan, tattoos for radiation, and surgery to have my port removed! I still have to have an MRI, 1 month follow up with my oncologist and a follow up with my breast surgeon as it has been 6 months since my lumpectomy! 6 months!?!?!?!? That is crazy! I can’t believe it. So many things to be thankful for. And just when I thought things might be going smoothly and I was on the road to recovery, I received a letter in the mail from the state. They only approved my leave for 4 weeks instead of the full amount requested due to my doctors orders. I am beside myself right now. But doing my best to not let it send me over the edge with worry. I will be calling work and trying to figure out what is going on and why. The letter stated I need to be evaluated by a state medical board doctor. Really???? You mean to tell me that a doctor from the state medical board is more qualified then my oncologist to give an opinion on my health? Sidenote: I called work and was told that the meeting with the state medical director is to determine whether or not I will be in fact coming back to work. This doesn’t make any sense as I already gave them my doctors letter and such that says I will be back.